The Internet of Everything (IoE) is making it possible for students to learn more, in new ways, in new places, with new connections to resources around the globe. Cisco Connected Learning is leading this new world in which colleges and universities are fully connected, faculty is fully empowered, administrators are fully informed, and students can learn without limits. As its title implies, this book provides an optimistic vision through a series of thoughtful, if not a provocative collection of writings from those closest to the system. 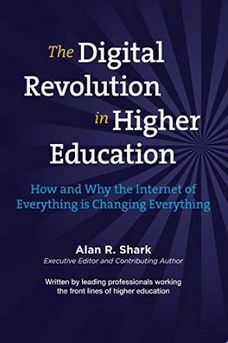 No discussion regarding the digital revolution in higher education is complete without taking into account the viewpoints of the innovators, the faculty, the students, the chief information officer, and the administration. The Digital Revolution in Higher Education is all about the changes regarding the advances in technology and how institutions of higher learning along with nontraditional organizations are utilizing these powerful new tools. Learn how this revolution will help reshape higher education. 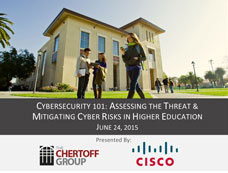 Cyber security threats in the Higher Education community are continuing to rise at an alarming rate. It is no longer a matter of if you will be hacked, but when. The Chertoff Group and Cisco discuss the need for a cybersecurity strategy that encompasses responsibility across the institution, from the boardroom to the classroom. 4-VA is a consortium of four universities in the Commonwealth of Virginia -- George Mason University, James Madison University, Virginia Tech and the University of Virginia -- that's working to realize Virginia's goals for higher education, through the use of technology. The University of San Francisco describes a remarkable new capability of managing safety and security in resident halls and solving the industry wide problem that has plagued campus security for decades. Learn how San Jose State University is partnering with Cisco to design and deliver the technology architectures needed to become a more agile institution and improve the student learning experience.